Here's this week's fabulous pick for Susanna Leonard Hill's Perfect Picture Book Friday. And, by the way, fabulous is NOT an understatement. And it is an "older" one (well, older than current, anyway) that is well worth reading. First Spread:"Come on, rain!" I say, squinting into the endless heat. Mama lifts a listless vine and sighs. "Three weeks and not a drop," she says, sagging over her parched plants. Synopsis (from Google Books): Come on, Rain!" Tess pleads to the sky as listless vines and parched plants droop in the endless heat. Then the clouds roll in, and the rain pours. And Tess, her friends, and their Mamas join in a rain dance to celebrate the shower that renews both body and spirit. Through exquisite language and acute observation, Karen Hesse evokes this refreshing experience, and Jon J Muth's lyrical artwork perfectly reflects the spirit of the text. Resources: A read-aloud lesson and paired text questions for this book are here. Kids could also make up their own rain dance, and talk about the differences between wet and dry, the water cycle, and what needs rain to grow. 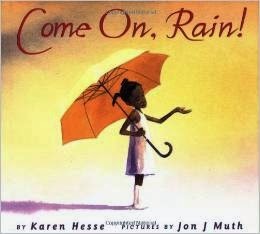 I recently read Come On, Rain! and loved little Tess. This PB is on my mentor list. Thanks for sharing! Mine too - I need to type it in for sure (in my copious free time LOL). Thanks for stopping by! I'm not wishing for rain right now... but later this summer! So onto my "read this" list with Come on Rain. I'm sure you will love it, Sue. Thanks for stopping by! We just got snow and rain and are very happy about it! This is a beautiful choice! Enjoy your weather - I'll take mine ;) Thanks for stopping by, Julie! The beautiful cover already draws you into the book. You can almost feel the summer heat. Lovely choice. Thanks, Patricia. The artwork IS gorgeous! I loved this book, start to finish when I read it at the library. Thanks for adding it to the list. Gorgeous! This is such a feel good book! It is :) Love it - thanks for stopping by, Joanna! Yes, I love it too! For all the reasons you said. I thought it a PPBF once as well. Probably one of the ones you mentioned.